We don't normally dwell on the choice of camera for professional use in Imagemaker. To some extent we are with Patrick Ciatto, who, when asked what camera he uses, invariably replies, "A black one"! However, the pre-Olympics launch frenzy has recently delivered a bewildering choice so the least we thought we might do is assemble some data. 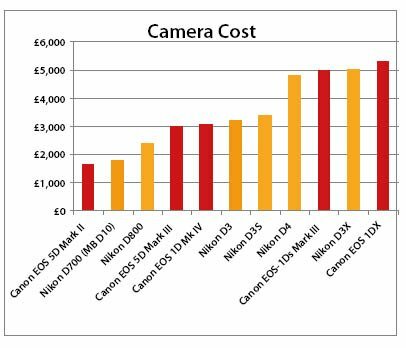 You can make the decision on your own - we will not be saying A is better than B - for every camera ever made there is always somebody, somewhere, who has made a crust off it! The overall frenzy among enthusiasts was demonstrated at Focus recently, when Fort Canon and Fort Nikon were stormed by increasingly grumpy punters anxious to get a look at the new toys. In the case of Nikon, their defences were compromised by thieves who stole their bodies ahead of Focus and so were left carting a D800 back and forth from a hotel safe each night, like a group of medieval knights transporting a religious relic across the north of England to Holy Island. The speed with which new models are brought out and a general disinterest from your editor makes catching up difficult. 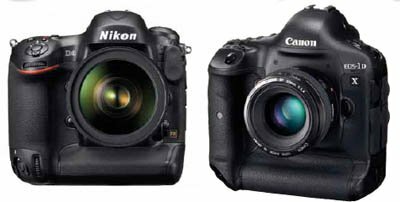 We also note that Canon users know almost nothing about Nikon model names and vice versa. To get round this we have collated the recent stuff into a single table opposite. The arrival of the D800 hot on the heels of the D4 has presented the social/GP photographer with a real dilemma. The D3 and D700 shared a chip which delivered a much admired low light performance which, in turn, expanded the areas in which the user could continue to operate.